Two posts in one day - egads! Here's another psuedo-Crew review for you ladies. Within twenty minutes of spying the new arrivals on the J. 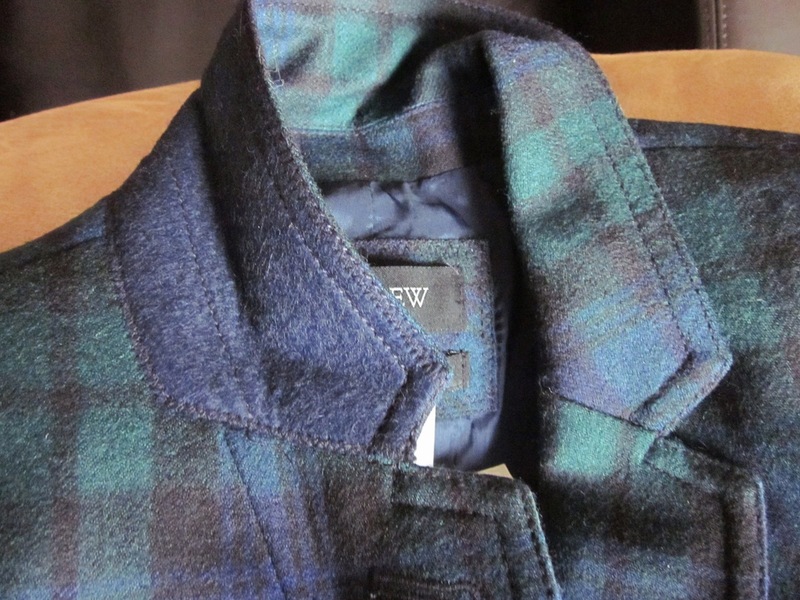 Crew web site last week, I was so enamored with the Schoolboy Blazer in Blackwatch Tartan that I closed my eyes and clickety-clicked my way through a purchase. 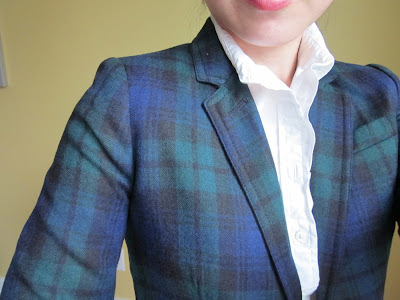 Modern blazer in an old school plaid pattern? Yes, please! As the blazer was not offered in petites, I grabbed a regular 2 and it fit me just fine - overall fit is typical schoolboy being kind of boxy in the middle, but the shoulders fit well and the sleeves were slender and not too long. This is the first schoolboy style blazer I've owned so I can't say much on whether the quality on the material has declined or not, but I thought this was a good weight for early fall and wasn't itchy on. Now whether it is worthwhile at full price ($228!) is questionable, but I had been leaning towards keeping it because I loved the pattern and wanted a new jacket for fall. So where's my typical big "and then ..."? Well, here it is - what had really sold me on the jacket were the appearance of the leather elbow patches. They were kind of retro, kind of cool, and it appealed to the old pipe-smoking highlands man in me. And then ... except in real life they weren't leather - which was disappointing considering the price of the blazer - and in fact the material was kind of thin and felt cheap. And what unfortunately drew me over the edge to the "this is going back" side is how ricidulously low the elbow patches were on my arms - they were forearm length, not elbow length. Heck, my 'bows almost completely miss the patches! 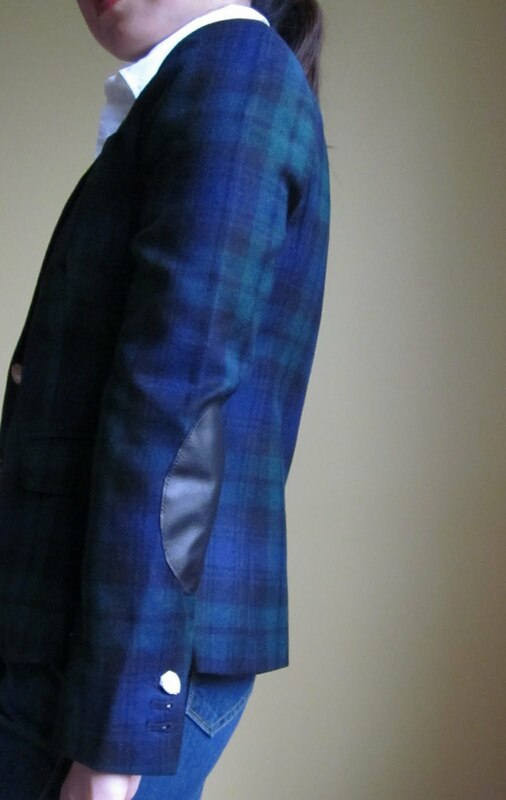 Now I am pretty darn sure this is not a flaw on the jacket but due to shorty-shorterson me, but it was enough to leave a stale pipe tobacco taste in the mouth of highlands Lisa. And so goes another personal Crew fail (but it wasn't a total low blow, I also bought the Quincy boy shirt and my love for the Crew still goes strong). If you want another perspective on the tartan schoolboy, check out AppGal's review here. Oooo, that's too bad. Not an epic fail, but a fail, nevertheless. Not a fan of the Schoolboy blazer fit so have completely overlooked it. I've been in love with the blackwatch tartan pattern since I use to collect JC catalogs in highschool. When I saw the Brooks Brothers Blackwatch Tunic I a) made grabby hands and b) thought immediately of you! Think I'll see if I can find it at my B&M and try it on. May have to be my early-Fall 2011 splurge! I ordered the school boy velvet in orange, it shipped today (was on back order). Now you have me really curious. But I am a lot taller than you, I think.... It is cute, though. Are you sending it back? what? fake leather patches on a 200$ coat? That's just ridiculous. I would cry (due to the otherwise beauteous pattern and fit) and have to send it back, just on principle. ridiculous! It does fit you beautifully though- maybe when it goes on sale! I love the jacket on you...too bad that the elbow patches didn't work out. It seems silly that they didn't use leather on a $200 jacket. I was wondering about that jacket. I have monkey arms but no bust, I may still be in trouble, huh? Can't wait to see you in the Button down. I drooled on my keyboard while sneaking a peek. That's so funny, I tried this blazer on in-store the other day and the elbow patches completely missed my elbows too (only I am 5'9 with relatively long arms)...go figure! 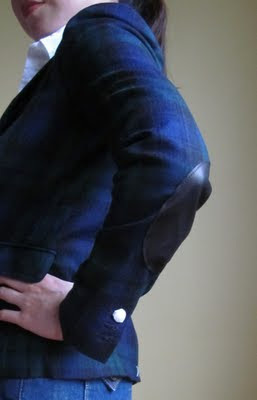 I really love the idea of the blazer..but I agree with you...having the elbow patches so low looks a bit odd. Still cute though! It looks great from the front, but the elbow patches are definitely in a weird spot. I still haven't jumped on the blazer bandwagon. Maybe this is the year! Maybe you can find something similar in Brooks Brothers. Aww, Lisa, this blazer has such a lovely pattern. Too bad about the non-leather and weirdly placed elbow patches. I would have been enamored by the fact that it had elbow patches too. You just aren't having much luck in the J. Crew blazer department this season. Does Boden have anything comparable? I know that Land's End Canvas has a sweater with elbow patches that I'm contemplating right now. I saw the blazer at the store and love the print but thought the patches felt chintzy, too. Especially at that price point. I can't believe how weird the placement is!! 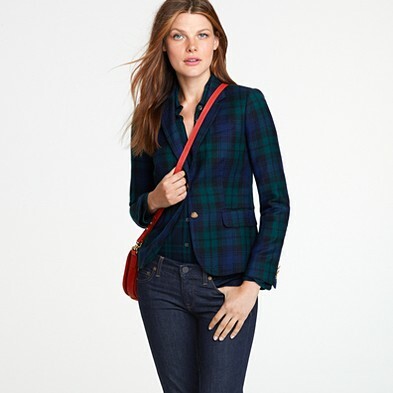 The blazer looks really cute on you - too bad it didn't work out! I never buy online from J.Crew because all their pieces fit me differently... can't ever tell what size I'm going to be!